For almost four decades, researchers have worked tirelessly to find a cure for the human immunodeficiency virus (HIV), which causes AIDS. There’s still more work to do, but a recent commentary published in JAMA  by Anthony Fauci, director of NIH’s National Institute of Allergy and Infectious Diseases, and his colleagues serves as a reminder of just how far we’ve come. Today, thanks to scientific advances, especially the development of effective antiretroviral therapy (ART), most people living with HIV can live full and productive lives. These developments have started to change how our society views HIV infection. In their commentary, the NIH scientists describe the painstaking research that has now firmly established that people who take ART daily as prescribed, and who achieve and maintain an undetectable viral load (the amount of HIV in the blood), cannot sexually transmit the virus to others. 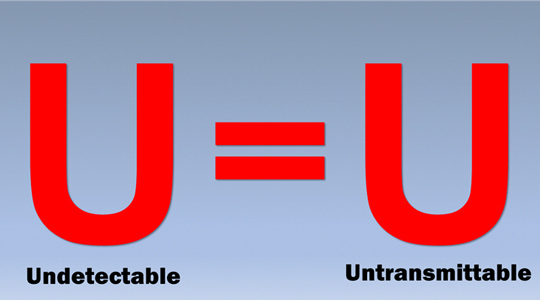 To put it simply: Undetectable = Untransmittable (U=U). The U=U message was introduced in 2016 by the Prevention Access Campaign, an international health equity initiative that aims to help end the HIV epidemic and HIV-related social stigma. The major breakthrough in combination ART regimens, which successfully reduced viral loads for many HIV patients, came over 20 years ago. But their importance for HIV prevention wasn’t immediately apparent. There’d been some hints of U=U, but it was the results of the NIH-funded HIV Prevention Trials Network (HPTN) 052, published in The New England Journal of Medicine  in 2011, that offered the first rigorous clinical evidence. Among heterosexual couples in the randomized clinical trial, no HIV transmissions to an uninfected partner were observed when ART consistently, durably suppressed the virus in the partner living with HIV. The data provided convincing evidence that ART not only treats HIV but also prevents the sexual transmission of HIV infection. The public health implications of what’s sometimes referred to as “treatment as prevention” were obvious and exciting. In fact, the discovery made Science’s 2011 list of top 10 Breakthroughs of the Year . Three subsequent studies, known as PARTNER 1 and 2 and Opposites Attract, confirmed and extended the findings of the HPTN 052 study. All three showed that people with HIV taking ART, who had undetectable HIV levels in their blood, had essentially no risk of passing the virus on to their HIV-negative partners. Of course, the success of U=U depends on people with HIV having the needed access to health care and taking their medications as prescribed every day of their lives . ART works by preventing the virus from making more copies of itself. It’s important to note that achieving an undetectable viral load with treatment can take time—up to 6 months. Viral load testing should be performed on a regular basis to ensure that the virus remains at undetectable levels. If treatment is stopped, the virus typically rebounds within a matter of weeks. So, strict adherence to ART over the long term is absolutely essential. Practically speaking, though, ART alone won’t be enough to end the spread of HIV, and other methods of HIV prevention are still needed. In fact, we’re now at a critical juncture in HIV research as work continues on preventive vaccines that could one day bring about a durable end to the pandemic. But for now, there are more than 35 million people worldwide who are HIV positive . With currently available interventions, experts have predicted that about 50 million people around the world will become HIV positive from 2015 to 2035 . Work is proceeding actively on the vaccine, and also on ways to totally eradicate the virus from infected individuals (a “cure”), but that is proving to be extremely challenging. Meanwhile, with continued advances, including improved accessibility to testing, adherence to existing medications, and use of pre-exposure prophylaxis (PrEP) in high risk individuals, the goal is to reduce greatly the number of new cases of HIV/AIDS. HIV Viral Load and Transmissibility of HIV Infection: Undetectable Equals Untransmittable. Eisinger RW, Dieffenbach CW, Fauci AS. JAMA. 2019 Jan 10. Prevention of HIV-1 infection with early antiretroviral therapy. Cohen MS, Chen YQ, McCauley M, Gamble T, Hosseinipour MC, Kumarasamy N, Hakim JG, Kumwenda J, Grinsztejn B, Pilotto JH, Godbole SV, Mehendale S, Chariyalertsak S, Santos BR, Mayer KH, Hoffman IF, Eshleman SH, Piwowar-Manning E, Wang L, Makhema J, Mills LA, de Bruyn G, Sanne I, Eron J, Gallant J, Havlir D, Swindells S, Ribaudo H, Elharrar V, Burns D, Taha TE, Nielsen-Saines K, Celentano D, Essex M, Fleming TR; HPTN 052 Study Team. N Engl J Med. 2011 Aug 11;365(6):493-505. Effectiveness of UNAIDS targets and HIV vaccination across 127 countries. Medlock J, Pandey A, Parpia AS, Tang A, Skrip LA, Galvani AP. Proc Natl Acad Sci U S A. 2017 Apr 11;114(15):4017-4022.